What is another word for galvanic? Of, produced by, as of, galvanism( g. battery, pile, producing g. electricity; g. belt, for applying it to the body; g. electricity, =foll. ); ( fig., of smile &c.) sudden& forced. 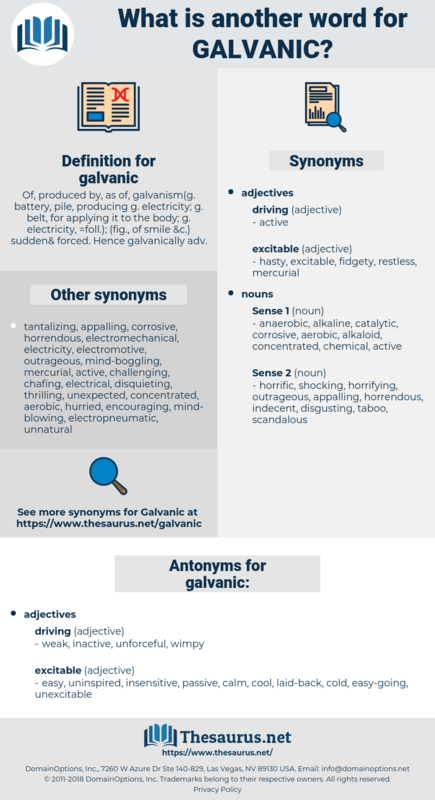 Hence galvanically adv. easy, uninspired, insensitive, passive, calm, cool, laid-back, cold, easy-going, unexcitable. humdrum, uninteresting, monotonous, tiresome, boring, dull, tedious, dreary, mind-numbing, unexciting. You will, therefore, I think, admit that with proper diet and possibly the aid of a galvanic battery a man may live, - barring possible death by violence, - say, two hundred years. The influence will stimulate your breathing, which will become rapid and irregular; your eyes will close and you will be unable to open them, and your hands and body may twitch and jerk as if you were being subjected to a series of galvanic shocks.